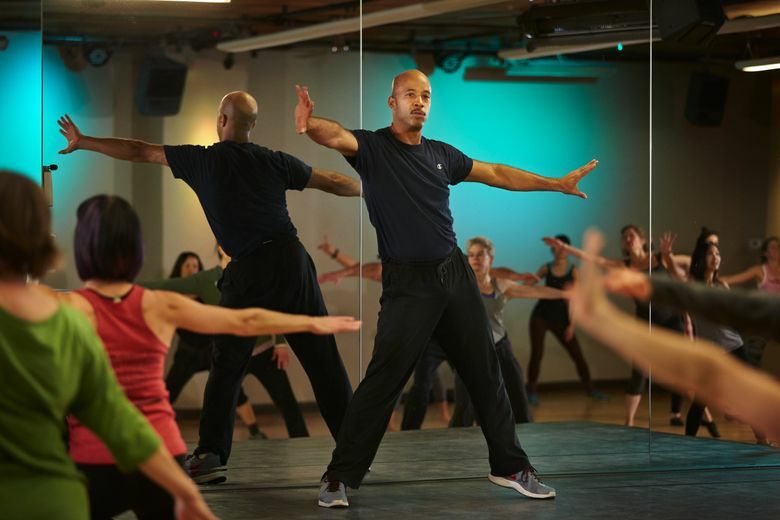 Chris Daigre’s energetic class is a workout for the mind and spirit. I DON’T DARE call myself a dancer, but I enjoy a good dance class. No matter how clumsy I feel at first, I always leave energized and with a big smile. When a friend insisted I take Chris Daigre’s dance class — she called it a workout for the “mind and spirit” — I was secretly excited for an excuse to dance. Daigre’s style is a mash-up of different techniques and approaches. His tunes are fun, from “Brick House” by The Commodores to “Don’t Stop ’Til You Get Enough” by Michael Jackson. His influences range from African to hip-hop to jazz. While he incorporates classical dance technique and counts while teaching steps, you’ll never hear “step-ball-change” while he teaches. Instead, he keeps it simple, breaking down relatively straightforward choreography — which I later learned changes weekly. I didn’t know any of this when I arrived. Warm-ups were easy, with moves to open up our shoulders and spines. Shortly after, he taught us a few steps, moving our feet side to side and throwing in a few shoulder-blade squeezes. His enthusiastic and clear instructions were easy enough to follow, and not knowing we were building our choreography, I didn’t focus at first on remembering them. I followed along, and noticed how enthusiastic my fellow dancers were. At first, I thought we were learning only a few rounds of choreography. My choreography capacity generally can handle simple moves, and we kept repeating the same moves, so I felt good. Then, another song came on, and I realized we were adding more. The steps were still simple, adding big arm sweeps and some faster footwork that moved us around the floor. We did moves to the side that spun around; a big swoop that got us into our hip joints; and ones that backed us up, including a little kick. Soon enough, things got more complicated. Daigre (pronounced deGRAY) threw in a side step with a foot sweep and spine roll-up that I could do when counting slowly, but not at all in time to the music. We repeated the whole thing multiple times to different songs, and whenever Daigre stopped demonstrating to let us dance on our own, each time we reached the foot sweep, my brain swirled and my feet did not obey. And it didn’t really matter, because we would jump right back into the choreography I did remember. Right when I thought I had reached my limited choreography capacity — also the time when I was sweating from dancing — we split up into two groups on opposite ends of the room. For the next section, we did simple steps across the room. For one of them that was basically a skip, he told us to really fly across. We all leapt across the room, laughing. During this section, one regular confessed to me that when she first started, she was so intimidated by the choreography, she used to slip out after 20 minutes. Now, she loves the challenge and perseveres through the class. Our floor work was the perfect interlude before returning to choreography. One more time! We did the dance again for an entire song, and clapped and cheered ourselves at the end. I left euphoric and joyful, the way I always do after dancing, no matter whether I got the steps. Daigre says he wants people to use their bodies and express themselves, rather than focus so much on choreography, and his approach is spot on. The class was accessible enough for newcomers, while more experienced dancers still enjoy the choreography. I often feel it doesn’t matter what kind of dance I choose. Any style that gets me into the spirit of moving and having fun is my favorite. Nicole Tsong teaches yoga at studios around Seattle. Read her blog at papercraneyoga.com. Reach her at papercraneyoga@gmail.com. Benjamin Benschneider is a Pacific NW magazine staff photographer.